After successfully defending my dissertation in May, I have been busy working on and preparing a few new projects which I will be involved in, in the next couple of years and which are all very exciting. Now that a new academic year is beginning I thought it was about time I began telling a bit about them. The first project I will discuss here is the MIMEHIST project, which aims at developing a scholarly annotation environment for EYE Filmmuseum’s Jean Desmet Collection. There is a very brief presentation of MIMEHIST on the website of CLARIAH (Common Lab Research Infrastructure for the Arts and Humanities). However, the description is very general and not very detailed which was also a reason for me to write a blog post. In this post I will describe how our project builds on earlier multimedia annotation projects in media studies, discuss some of its theoretical underpinnings and how these may nurture new ways of using annotation in film historical research. The focus in this post is mostly on theory, methodology and functionalities. The historical case studies of the project will be described in greater detail in another post. Towards the end of February I received a grant for a video annotation project which will last a bit more than a year – from April 2017 to June 2018. The project is called MIMEHIST: Annotating EYE’s Jean Desmet Collection and is a pilot project within the larger research program CLARIAH (Common Lab Research Infrastructure for the Arts and Humanities) which aims at developing a national research infrastructure for humanistic disciplines and the arts in the Netherlands. Within this research program there was a call for pilot projects last year, which invited applications focusing on digitized collections and different historical research questions and case studies. The cases and collections will be embedded in the Media Suite developed by CLARIAH in order to advance digital research methods in media studies. It will be available for scholars in the Netherlands with a Dutch university login. With help from Liliana Melgar, postdoctoral researcher at the University of Amsterdam, I wrote an application in the fall of 2016 focusing on developing an annotation environment for the Jean Desmet Collection of EYE Filmmuseum in Amsterdam. The project officially started in April and I am working on it together with Liliana Melgar who is in charge of defining the user requirements with me, as well as Willem Melder from the Netherlands Institute for Sound and Vision who works on data interoperability and Roeland Ordelman and Jaap Blom who are taking care of the software development and engineering within the project. After the project’s beginning we also had the great luck of being joined by Ivan Kisjes, who works as an archaeologist and programmer at the University of Amsterdam’s CREATE project, and who will be doing OCR work and text mining in our project. The Jean Desmet Collection, preserved at Amsterdam’s EYE Filmmuseum, contains the archives of film distributor and cinema owner Jean Desmet (1875-1956) who was active mostly in the early period of silent cinema and its transitional years. The collection consists of approximately 950 films produced between 1907 and 1916, a business archive containing more than 120.000 documents (these will be OCR’ed in our project), some 1050 posters and around 1500 photos. Parts of the collection were acquired by the Filmmuseum shortly after Desmet’s death in 1957 and then gradually expanded throughout the years with additional acquisitions. The Desmet Collection is unique because of its large amount of rare films from the transitional years of silent cinema, and because of the richness of its business archive holds extensive documentation of early film exhibition and distribution practices in the 1910s. These features contribute to its immense historical value which was one of the main reasons why it was inscribed on UNESCO’s Memory of the World Register in 2011. Most of the material in the Collection has been digitized in different projects throughout the years. In the past few months I have worked on a report to outline exactly how the digitization work for each of the Collection’s subcollections was carried out which will provide a fundament for embedding it in the CLARIAH Media Suite. For more information on the Desmet Collection, EYE Filmmuseum has made a dossier on its website. And, for a more elaborate history of the Collection, film historian Ivo Blom has written a beautiful monograph on Desmet’s business activities and life which is available as an open access book from the Amsterdam University Press in the OAPEN Library. Where do the methods and assumptions of MIMEHIST come from and why are they important for media historians? This is what I will try to answer in this section. Readers of this blog will know that I have a great deal of enthusiasm for multimedia editions of archival film which facilitate analytical interaction with film – or video versions of films. These formats work with audiovisual media in media res by insist on a certain kind of audiovisualcy – as film scholar Catherine Grant has aptly called it – as a basis for scholarly interpretative processes – be they critical or historiographical. A fundamental key tenet in this kind of scholarship is that scholars, instead of only writing about film, cite, segment and re-edit films in different ways and to different ends as a foundation for their reflection and interpretation. There are several projects and theoretical writings which MIMEHIST finds inspiration in, in this regard. I would like to highlight some of them here. In particular, I have been inspired by the Digital Formalism research project carried out in Vienna. This was a research project on Dziga Vertov’s work and theory which ran from 2007-2010 involving media scholars at the University of Vienna, archivists from the Austrian Filmmuseum and computer scientists from the Vienna University of Technology. Through extensive manual segmentation and data visualization the project explored Vertov’s montage style in relation to his theories on film montage and rhythm. Moreover, I have previously written enthusiastically about the Hyperkino DVD series which aimed at developing a historical-critical presentation format for annotated versions of Soviet classics or rarities. Before these more recent projects, there have been several advanced efforts to conceive scholarly multimedia projects for film historiography in the past decades. In the 1990s, for instance, there was a rich experimentation with what was then referred to as hypermedia in CD-Rom formats in film studies, in the US in particular. Several groundbreaking projects were developed such as Lauren Rabinovitz’ The Rebecca Project (1995), the multimedia textbook The Virtual Screening Room developed at MIT by Henry Jenkins, Ben Singer, Ellen Draper and Janet Murray between 1992-1999, as well as Yuri Tsivian’s CD-Rom on pre-Soviet silent cinema Immaterial Bodies: Cultural Anatomy of Early Russian Cinema (2000). The latter was released by the University of Southern California’s Labyrinth project in its groundbreaking series of Cine-Discs edited by Marsha Kinder. An original order form for Yuri Tsivian’s Cine-Disc Immaterial Bodies: A Cultural Anatomy of Early Russian Film (2000) which Marsha Kinder has uploaded to her great website. Conceptually however, one may trace the urge to work directly on films as a historicizing working method even further back, for instance to the 1920s when Parisian cinephiles would be making compilation films of moments of particular cinematic beauty – or photogénie – to mark the end of a year spent at the cinema with a critical hit list. Or for instance – as film scholar Michael Witt has discussed with great insight – to Jean Mitry’s Film sur le montage (France, 1965), as well as to a great deal of compilation and found footage films. …segmentation is a mise-en-abîme, a ‘plumbing of depths’, a process that has no end theoretically – which does not mean that it has no meaning, in fact, that is its whole meaning. In recent years, Bellour’s ideas to a large extent provided the fundament for the brilliant scholarly video annotation software Lignes de Temps, developed by the Pompidou Centre’s Institut de recherche et d’innovation. Unfortunately, this software is no longer being updated. …the appropriate methodology of film history cannot be attained in our time without the full cooperation of the film archives, which possess the prints and have access to technical facilities, without which it is impossible to grasp the cinematic structure of a film. In many respects, these projects and theoretical texts underpin the MIMEHIST project’s development of annotation functionalities for media scholars, working with the example of EYE’s Jean Desmet Collection. It would undoubtedly sound a bit grand to claim that MIMEHIST will fulfill all the ambitions articulated by them. However, it is certainly a theoretical lineage which we feel indebted to and find inspiration in, in developing video annotation for historical analysis in new directions. Working from these theoretical coordinates we try to nurture a historical methodology relying on video annotation which we may qualify as more open-ended and dynamic, something we will also try to achieve by drawing on annotation practices in other disciplines. How are we planning to achieve this and how will this differ from previous multimedia editions of (archival) films or annotation software/projects? There are several aspects in which we could say that our project wishes to create a research situation which allows for doing audiovisual analysis reminiscent of the projects discussed above but which also builds on them by drawing on annotation software and practices in other disciplines. First of all, we will facilitate and encourage segmentation and labelling of films as a basis for interpretation of, in particular, stylistic and formal aspects of films. The annotation environment resulting from MIMEHIST should ideally allow scholars to analyze digitized films from the Jean Desmet Collection – and audiovisual material more broadly – through a process of segmentation and labelling. It will allow scholars to engage in a process of coding through labelling, in a manner which we consider congruent with the “plumbing of depths” of film segmentation as suggested by Raymond Bellour; a subjective interpretation process which is not finite, but which may have different end points for different scholars because they observe and annotate different aspects of a film. By creating different layers and timelines in the CLARIAH Media Suite’s Segmenting Player scholars may categorize shot types, scenes and sequences following a personal coding scheme. Furthermore, scholars may also use such a coding procedure to get a better grasp on the structure of films, as suggested by Petric, in order to establish firm empirical evidence for their interpretation. MIMEHIST will not facilitate statistical functionalities however – for instance shot boundary detection – but may allow scholars to annotate and count film features as they like. A first glimpse of the CLARIAH Media Suite Segmenting Player in its early development phase. In order to develop this, MIMEHIST also looks beyond film theory, and finds inspiration in qualitative methodology and Grounded Theory approaches used for coding video or audio interviews in the social sciences, anthropology and ethnography. What scholars in these fields often do is to use video/audio editing software to tag and label interview bits and organize them into different categories and color-coded layers on a time-line, while linking them to related materials. This work lasts until the researcher feels the material is exhausted in a subjective – or collaborative – coding process. The coding procedures of qualitative methodology may be considered somewhat similar to the mise-en-abîme-feeling of film segmentation as described by Bellour because it is an analytical process without a logical end point. For MIMEHIST this is interesting because it allows us to draw productively on a lot of expertise and practical experiences on interpretation of audiovisual material from qualitative methodology in order to develop film and media annotation further. Beyond labelling and tagging, it is also the idea that scholars should be able to present an annotated version of a film with MIMEHIST and synthesize the main findings of their work in an edited and staged version for peers as a last step in their historiographical operation. This may be reminiscent of the kind of presentation format which Hyperkino developed. In particular, it will rely on links made between films and related material in the Desmet Collection which researchers can organize in a personal user space. Furthermore, the presentation format of MIMEHIST should ideally offer a kind of video playback mode in which annotations – or footnotes as they were called in Hyperkino – may be accessed by clicking on an icon. It will also differ in several fundamental aspects from a project such as Hyperkino. First of all, MIMEHIST will allow scholars to make different versions of the same film. Scholars may thus produce different – perhaps competing – interpretations of the same title. This should allow for a greater multiplicity of viewpoints to be expressed about the films in the Desmet Collection from various theoretical angles and will also, hopefully, nurture a more open-ended and dynamic historical interpretation of the films as well as representations of them. Whereas Hyperkino relied on the closed DVD-format to present one interpretation, MIMEHIST will not have the limitation of such a format. Furthermore, we also aim to make the scholarly annotation work more transparent. For instance, in addition to making an edited, annotated version available to other scholars, a researcher may also offer access to the work folder and coding underlying a version so as to allow other scholars to critically scrutinize exactly what they did or to engage in collaborative annotation. Hopefully this will all work out. These functionalities are now in the development phase and what I have discussed above is the goal we are working towards. I will write more about the case studies which the project will focus on later. But as it looks now, I have lined up two types of cases: one case, which will focus on non-fiction films in the Desmet Collection, with particular attention to the representation of war during WWI and the films’ distribution in the Netherlands in this period. A second case study will focus on an incomplete film, to analyse how its form and distribution life may possibly be better understood by linking it to film-related material in the Desmet Collection. More about that later. Bellour, Raymond, ed. Constance Penley. The analysis of film. Bloomington: Indiana University Press, 2000. Gauthier, Christophe. La passion du Cinéma. Cinéphiles, ciné-clubs et salles spécialisées à Paris de 1920 à 1929. Paris: AFRHC and École des Chartes, 1999. Petric, Vladimir, ”From a Written Film History to a Visual Film History”, in Cinema Journal, Vol. 14, No. 2, Symposium on the Methodology of Film History (Winter, 1974-1975) 21. Witt, Michael. Jean-Luc Godard. Cinema Historian. Bloomington: Indiana University Press, 2013. Since last summer I have been increasingly interested in exploring the works of the French 1920s avant-garde directors – Jean Epstein, Germaine Dulac, Abel Gance, Louis Delluc and Marcel L’Herbier – beyond the most well known films from this period, which were programmed in the first year of my film and media studies program in Copenhagen in 2005/2006: films such as Jean Epstein’s La Chute de la maison Usher (The Fall of the House of Usher, 1928) or Dimitri Kirsanoff’s Ménilmontant (1926). While those films were absolutely eye-opening to me back then and left me with a completely different view on what film could be I never made the effort to dig as deep into that period as I would have liked. Film-viewing-wise, I remember I was mostly busy watching Italian classics and exploitation cinema back then. However, all that changed when I began reading up on early film history writing and the recognition of film as an art form last year as a part of my research. In particular I became interested in the gradual discursive change toward film and the perception of film as an art form and its institutionalization in French film criticism, theory and ciné-club culture in the late 1910s and throughout the 1920s. In this respect, one of the critics and key figures of this moment whose early film histories have interested me in particular is Léon Moussinac. Moussinac belonged to the inner circle of film critics and theorists in Paris and was a militant supporter of film as an art form, playing a central role in recognizing for example Soviet cinema as such – in particular Vsevolod Pudovkin and Sergei Eisenstein – through his central engagement in the communist ciné-club Les amis de Spartacus, which was launched in the summer of 1927. Probably the best introduction to this period and its milieu has been written by the American film historian Richard Abel in his book French Cinema: The First Wave, 1915-1929 (Princeton University Press, 1987), which in retrospect regards this particular period with its cinephile cinema-going habits and critic-filmmaker figures as a ‘first wave’ preceding the later French Nouvelle Vague and its mixture of popular cultural and neo-avantgardist attitudes. A little introduction to Moussinac written by Abel can be found here. In French, perhaps the sociological analysis proposed by film conservator and historian of the French National Library Christophe Gauthier in his La Passion du cinéma: ciné-clubs, cinéphiles et salles spécialisées à Paris de 1920 à 1929 (AFRHC/EDC, 1999) remains one of the most engaging studies of the period which I have come across, partly because it investigates the links between collection building in the 1920s ciné-clubs and film preservation extensively. 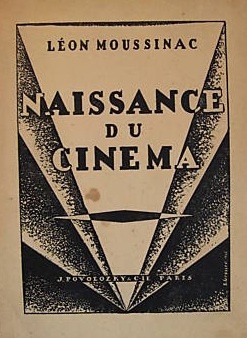 Léon Moussinac wrote several film histories throughout the 1920s, both general ones and film histories focused on national cinemas, on for example Soviet cinema (Le Cinéma Soviétique, Librairie Gallimard, 1928). Arguably, his most influential film histories are the early Naissance du Cinéma (J. Povolovzky & Cie, Éditeurs, 1925) and Panoramique du Cinéma (Au sans pareil, 1929), because of their discernment of a set frame of reference for films which in the eyes of the 1920s cinephiles had contributed to the establishment of film as an art form (these books can still be found at quite reasonable prices online!). What I find particularly fascinating in reading these books today is the detailed insight they give into the canon formation and appreciation of silent films which are still with us and which continue to be taught as key films in the history of cinema, while at the same time, they may give an impression of some of the films which tend perhaps to be forgotten today and enjoyed only within specialized circles. Furthermore, it is intriguing to go through them because they nourish an understanding of how contemporary film theory in its conceptualization of film as an art form laid the foundation for film history writing. The structure and content of Moussinac’s Naissance du cinéma is for example particularly interesting in this aspect, with an opening statement which serves to legitimize film as art, by proposing a list of films that are particularly artistic and a theoretical conception with which to discern then. We are living in admirable and profoundly touching times. In the great turmoil of the modern an art is born, develops, discovering one after one its proper laws, marches slowly towards perfection, an art which will be the very expression, bold, powerful, original, the ideal of the new times. And it is a long hard stage, towards the beauty, in which too few yet believe because they have not fully understood its astounding truth. (Own translation). Nous vivons des heures admirables et profondément émouvantes. Dans le grand trouble moderne, un art naît, se développe, découvre une à une ses propres lois, marche lentement vers sa perfection, un art qui sera l’expression même, hardie, puissante, originale, de l’idéal des temps nouveaux. Et c’est une longue et dure étape, à la beauté de laquelle trop peu croient encore parce qu’ils n’en ont pas compris pleinement la formidable vérité. (Original quote). This is followed by a little list which indicates the most important stages (étapes) in this development toward the birth of an art form consisting mostly of European (French, German, Swedish) and North American fiction films, with a strong emphasis on the French avant-garde represented by the films of Louis Delluc, Marcel L’Herbier, Abel Gance and Jean Epstein. That the films of the latter were recognized as particularly artistic pertained to a view which became increasingly common on French film criticism, theory and distribution at the time that conceptualized as of French films as particularly artistic. This is visible in Moussinac’s Naissance du Cinéma in its extensive use of the notion of photogénie as the foundation for its theoretical conception (‘conception théorique’). This term, while used with subtle and important differences in nuance in the writings of Jean Epstein, Louis Delluc and Moussinac, sought to capture or formulate the subjective experience of a particularly beautiful cinematic moment, usually of a very short duration: a gesture, an expression or for example a detail in cinematography and mise-en-scène which appears striking because of a particularly aesthetic quality. The identification of these moments of cinematic beauty what was led the French cinephiles to make their lists of the most artistic films, in contemporary film reviews which would then serve as support for a historicisation of film art’s development. It may seem somewhat dubious that the French tended to acknowledge their own cinema as a particularly artistic one in this period (and it may very well be the case to some extent, given that this historical view excluded so many other films) but I think it is quite important to keep in mind that the dynamic of this conception of cinema which is visible in for example Moussinac’s writings cinema may be regarded – in line with the argument in Abel’s history of the period – as very much similar to that of the later “second wave” – the Nouvelle Vague. Here seemed quite simply to be a group of individuals – more or less like-minded – who missed something more daring from their own cinema production, being – in the case of some – fascinated by developments in American, Soviet and Scandinavian cinema, thus promoting at the same time film art through film criticism/theory and filmmaking. It is exactly because of these qualities that I have begun seeking out the 1920s French avant-garde films to a greater extent, to gain insight into how a common conception of film history as it continues to be taught today emerged. Of course, it is also to watch some truly remarkable films! Thus, yesterday evening I had the immense pleasure of watching Marcel L’Herbier’s L’Homme du large for the first time (1920). This is in some respects a breakthrough film for L’Herbier being a great success with contemporary film critics and with a general audience. It is a powerful drama about a little family living by the seaside, in which the father – Nolff – badly wishes to get a son, in addition to his daughter, with whom he can share and teach his passion for the sea. However, when finally the son – Michel – is born, he is drawn instead to the city from which the family had moved to live itself by the sea. Developing a more and more intense antipathy towards his father who remains blindly faithful and loving of his son almost regardless of his conduct, Michel eventually ends being tangled up in the seedy city life and its violence, ignoring at the same time – to the agony of his sister – his mother’s increasingly grave illness. The film is told in a complex flash-back structure where the father is first seen living as an hermit, because of the break with his son, to then look back at the development of their relationship and their eventual break-up. It contains many emotionally strong scenes, and is visually stunning, with an incredible use of colors (according to L’Herbier’s notes) to depict the sea, complex editing between locations, inter-title design – sometimes in split-screen, super-impositions and framing, of which I have included some examples of screen caps below. Thus, what often gives L’Homme du large, its emotion, is this constant presence of the sea which shakes the drama, penetrates it, invades it, dominates it even, gives it its terrifying bursts, its endlessness. The sea’s voice is real, one is subjected to its grave tremendous tone, a sort of pedal (pédale) which upholds the chant of beginning at the end of the film. (Own translation). Ainsi ce qui procure à L’Homme du large, souvent, son émotion, c’est cette présence constante de la mer qui secoue le drame, le pénètre, l’envahit, le domine même, lui prête ses sursauts terribles, son infini. La voix de la mer est réelle, on subit sa note grave prodigieuse, sorte de pédale qui soutient le chant du commencement à la fin du film. (Original quote). The film is released in a highly elegant double-DVD set from French Gaumont together with L’Herbier’s El Dorado (1921). 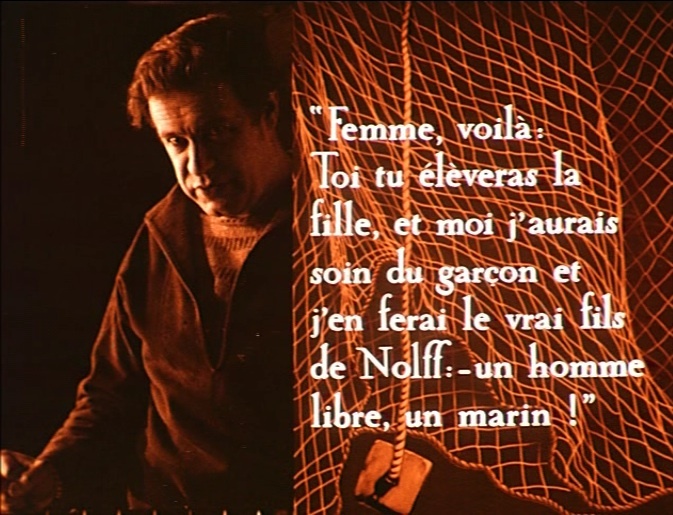 Each film is accompanied by a detailed booklet, containing reproductions of the original poster art, elaborate notes on the restorations – particularly interesting with regard to L’Homme du large‘s colors – and historical articles, for example Henri Langlois’ praise of L’Homme… Highly recommended! When Nolff learns that his wife has given birth to a boy, he proposes a clear division of their education between them: his wife can take care of their daughter, while Nolff himself will educate their son to become “- a free man, a sailor!”. Here, an inter-title appears simultaneously with the action in split-screen. 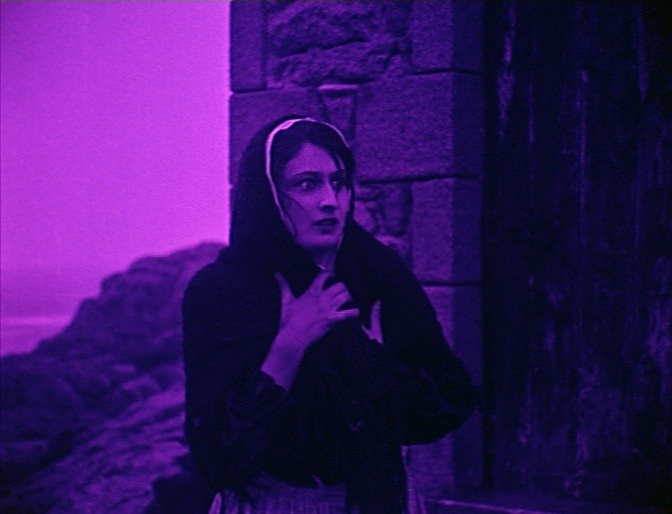 The terrified look of Michel’s sister Djenna set to the background of the sea, as she gathers courage to go into town and bring back her drunk brother to their mother’s sickbed. 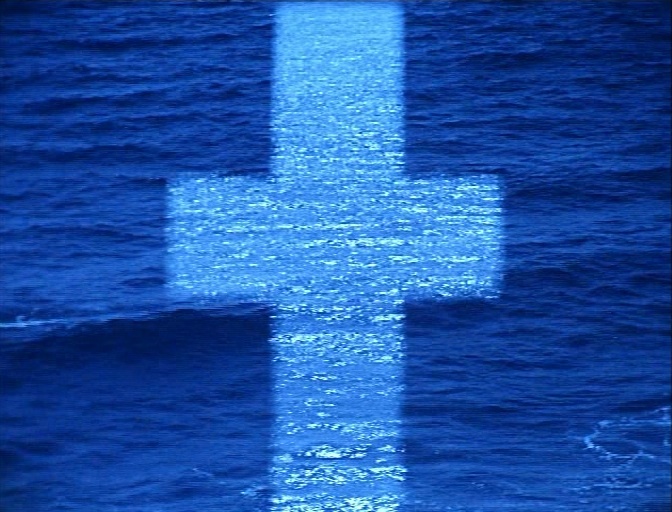 One of the film’s stunning visual features is its use of masks in different shapes and super-impositions; in one of the most dramatic scenes for example, a cross suddenly appears super-imposed over the sea.